Although we don't make custom items for individuals, we are happy to take on larger quantity projects (50+ Pieces) for businesses or events. Below you can see an example of some of the many projects we've done over the years. The trademarked items here are for illustrative purposes only. 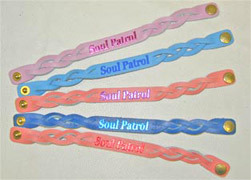 we will only imprint images and logos for companies that own the copyright or have permission. Please Call or Email for more information 1-800 338 7637. 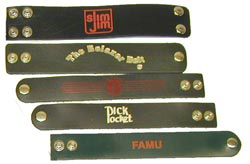 We've worked with various companies that do leather promotions and giveaways. We can emboss on almost any item we make. 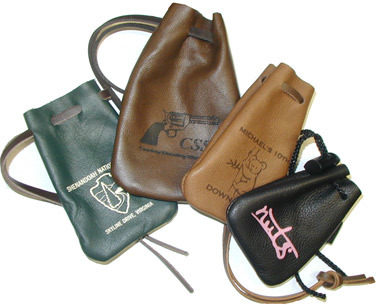 Leather Pouches as party favors are one of our most popular. 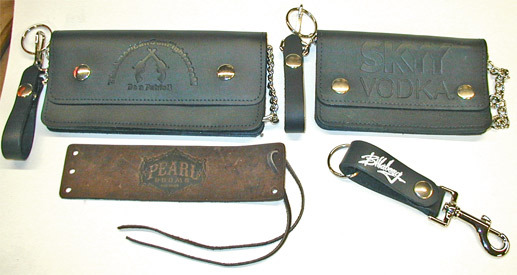 Imprinted leather pouches are also great items for gift shops, museums, and tourist attractions. Custom imprinted Leather Pouches are a great way to package and market your unique product. We also have many styles of leather cuff bracelets and we can even have custom sizes and widths made to meet your specific needs. We are happy to emboss on wallets and key chains. *We are happy to consider custom projects to fit your company or organization's specific needs. *Fast Turn-Around. On simple items we can have your project finished in as little as 2-3 Weeks (sometimes faster). *Small Quantity Requirements. We accept Projects as low as 50 pieces! For more information please Call us at 1-800-338-7637 or Email us at nstarleather@shtc.net.